Far Cry 5 has been out for a month. Its big open world based in a fictional Montana has been picked clean by millions of people. Collectively they’ve caught lots of fish, thrown millions of sticks of dynamite, and been sprayed by a lot of sneaky skunks. Publisher Ubisoft has been contributing weekly live events, new maps to the online Far Cry Arcade mode, and has promised new story DLC in the future, but for the moment the game remains in a holding pattern. Here’s a recap of everything players have been doing in and saying about the game over the past 30 days, as well the major new announcements and updates trickling out from Ubisoft. Far Cry 5 releases on 27 March to generally favourable reviews. The game’s story is largely panned, but its open world and free-flowing mission structure are a breath of fresh Montana air. Our review arrived at a similar conclusion: ignore the story and the hype around the game’s politicised American setting and you’ll find plenty to enjoy in the raucous sandbox moments in-between. People immediately fall in love with Boomer the dog, one of the game’s Fangs for Hire who, as confirmed by Ubisoft, is an extremely good boy but, for reasons still unexplained, can’t ride in cars with you. In addition, the game’s turkeys turn out to be too strong, even after a pre-launch patch nerfing their attack power, so the day one patch takes them down another peg. Far Cry 5’s microtransactions aren’t onerous. Unlike some games that gate interesting content behind burdensome grinds or real world cash, Far Cry 5’s silver bar system is very easy to ignore for anyone inclined to do so. Co-op is a mixed bag. 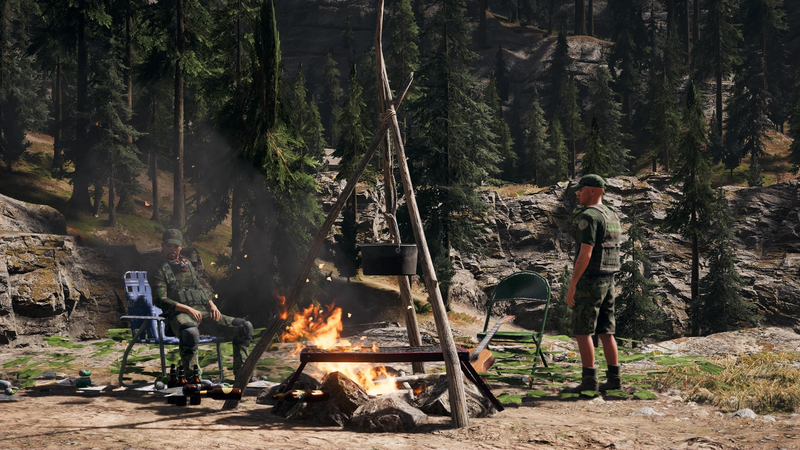 Playing with friends can be a lot of fun: Far Cry 5's ridiculous emergent moments are even better when shared with someone else. That said, co-op suffered its fair share of bugs during the first couple weeks and, most importantly, doesn’t allow the joining player to share in mission progress, a drawback that remains to this day. Far Cry Arcade struggles at launch as well. The game’s map editor is robust but also overwhelming. Player-made maps are most lacklustre in the beginning, and the missions that come pre-made by Ubisoft are pretty plain. The Arcade building blocks borrowed from other series like Assassin’s Creed and Watch Dogs include things like piles of hay rather than pirate ships. A number of players, inspired by games like PUBG, rush to make their own battle royale knockoffs. Players love the game’s shovels, weapons of mass destruction that can wreak havoc from surprisingly far away. People start using them to hunt, take out helicopters, and perform trick shot kills on a range of unsuspecting enemies. Amid an otherwise not very memorable arsenal, the shovel rises up and becomes a major meme in the Far Cry 5 player community. By 1 April talk spreads of the possibility that Bigfoot is in the game. Players start poring over a side mission oriented specifically around the creature in search of clues. They make up maps, try to connect the various seemingly related dots around campers, dead people in caves, and garbage strewn about in the forest hoping to catch a glimpse. Currently Bigfoot remains unsighted. The game’s first weekly Live Event goes up on 3 April, and it’s a dud. Called Well Done, it tasks players with setting animals on fire without using flamethrowers or molotov cocktails and rewards them for doing so with a reskinned version of an existing weapon and a gold mask. The subsequent events don’t turn out to be very interesting either, two of which, Arcade Dawn and Road Kill, launch with bugs. The most recent event, which began on 24 April, also reinforces an ongoing problem in which challenges appear to be geared toward players still in the middle of the game. They revolve around killing enemies whose presence in the game’s world drops significantly once the game is beaten. Ubisoft releases an extremely helpful Far Cry 5 map tool online on 4 April. Unlike the one in the game, it’s automatically populated with all the icons representing points of interest and they don’t disappeared when you zoom out, making it easier to track down uncompleted quests. Around this time more and more people start beating the game. In addition to trying to interpret its ending, more than a few get caught in a special bug where the end credits keep looping forever. Far Cry games are known for weird glitches—it’s part of their charm—but not being able to keep playing after beating the game effectively amounts to a wiped save file. While players on PC discover workarounds, and Ubisoft patches the game to prevent it from happening in the future, players who have already encountered the bug on PS4 and Xbox One remain in limbo. Far Cry Arcade Nights begin on 6 April, weekly events every Friday where new maps are collected from the community by Ubisoft and curated so they’re easier to play. Far Cry Arcade remains hard to navigate overall while in the game, although Ubisoft tries to address the issue with an online search tool. Ubisoft releases the game’s second major patch on 9 April. It fixes a number of bugs and aims to address stability issues over all as well as problems with coop connectivity and Far Cry Arcade matchmaking. It doesn’t add any big new features to the game though, like a New Game + or harder difficulty setting. Weird radio static is discovered across various portions of the map on 10 April. Looking for more things to do in the world, a small cadre of players try to triangulate the position of whatever mysterious thing the static might be hinting at. Like the Bigfoot search, so far Far Cry 5 doesn’t appear to have any big secrets buried beneath the surface, but that doesn’t stop the game’s most dedicated players from continuing to look. Weekly Arcade Night livestreams begin on 13 April, with Ubisoft community managers streaming the player-made maps that have been highlighted for that weekend, as well as the bonus challenges associated with completing them. The streams don’t offer much information about what’s coming down the road for the game. While waiting for word of when the game’s first DLC will release, or if Far Cry 5 will ever get extra save slots, players based in Montana begin sharing pictures of real world buildings and landmarks that are the same as what’s in the game, like this church. For now at least, it doesn’t appear that the game will be getting the kinds of regular post-launch updates that Assassin’s Creed Origins did, at least not as quickly. For as beautiful as it looks, Far Cry 5 still doesn’t even have a photo mode. And that’s where things are at. Far Cry 5 was the fastest-selling game in the series’ history. Just over four weeks out, however, the lack of continued updates from Ubisoft outside of curating the game’s online arcade mode has led to players drifting away. There’s still a solid foundation for the game’s developers to continue building on post-launch. If Rainbow Six Siege and Ghost Recon Wildlands are any indication, Far Cry 5’s most vibrant days could still be ahead of it.